Clackamas, Ore. (Sep. 20, 2011) – Riders can go farther and be more prepared knowing they’ve got the power to recover their vehicle if the trail gets tough, thanks to the release of the WARN® XT17 Portable winch. Washouts, swollen creeks, and fallen trees can no longer ruin the fun. This winch enables riders to take their experience to the next level since there is less worry about getting stuck. 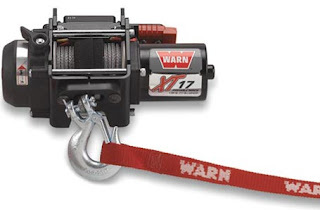 The WARN® XT17 Portable winch is ideal for adventure-touring motorcycles, ATVs, Quads and other lightweight vehicles since it weighs only 8.5 lbs., has 40’ of lightweight, easy-to-handle synthetic rope and pulls up to 1,700 lbs. Rigging is easy too; just connect the winch to any 12V battery-equipped vehicle, use the included rigging strap, and let the WARN® XT17 Portable winch go to work. Like other WARN Powersports winches, the XT17 Portable is equipped with a reliable, fast three-stage planetary geartrain, a powerful motor, a patented load-holding disc brake and durable controls. This type of winch is perfect for the solo rider, or for those who don’t want to permanently attach a winch to a vehicle. The XT17 Portable also offers two control options: either a corded remote or a mini rocker switch on the vehicle. This enables riders to choose the best control for their specific application. For utility use as well as lightweight vehicle recovery, Warn Industries also offers the RT15 Portable winch, which has a 1,500 lb. capacity, 25’ of durable wire rope, and weighs just 12.5 lbs.—ideal for both on-the-job or on-the-trail applications.